Turn left out of the Rowing Club down the left-hand side of the canoe lake, along the Esplanade and past the Bus station. Continue to the Prince Consort (1mile) and up St. Thomas’s St. as far as Spencer Road. Turn right into Spencer Road and run its full length, passing through the footpath at the end turning right down Ladies Walk which runs alongside the golf course. Run the full length of Ladies Walk (2 mile), and continue across the bridge and up the other side to Binstead Church. Cross the main road and take the footpath directly opposite, follow it past the pond and up the hill, then turn left on Newnham Lane. Turn left as the road joins Newnham Road, then after 70m take the footpath on the right which runs behind the houses (4 mile), at the next footpath junction go right then left and down the hill of the common. At the bottom of the common go straight ahead and up Play Lane (gravel track), going up killer hill into Playstreet Lane. At the end of the road cross over into Partlands Avenue (5 mile), then left into Swanmore Road. Run along Swanmore Road and turn right into Well Street run to the bottom of the hill and turn left into Quarry Road. At the end of Quarry Road turn right into St. Johns Road but be prepared to cross the road very carefully, so that you can turn left into Monkton St almost immediately. 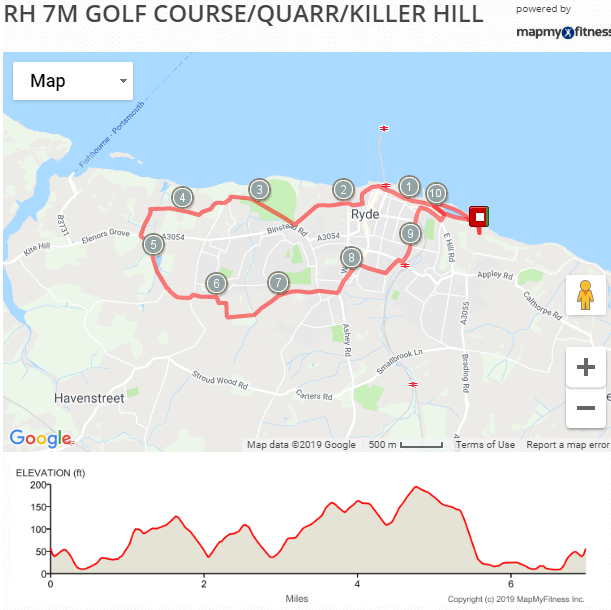 Run the full length of Monkton St (6 mile), and turn right into the Strand running to the Main Road at the bottom of East Hill Road. Stay on the left, follow the Main Road around crossing safely to the right when you are opposite the Canoe Lake. Follow the Main Road and turn right onto seaward side of the canoe lake. Run the full length of the Canoe Lake and then to the Rowing Club and the finish.